Professional quality care in an easy to use four step system that exfoliates, revitalises, renews and protects hands. 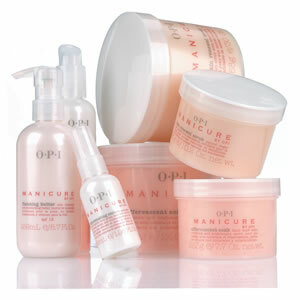 For younger looking hands experience the luxurious restorative manicure by OPI. Proven Nail Envy technology in a formula designed specifically for soft and thin nails. Fortifies nails with extra calcium and sea minerals. Proven Nail Envy technology in a formula for sensitive and peeling nails. Protects with antioxidant vitamin E and emollient-rich Kukui Nut Oil plus soothing Aloe Vera. Formaldehyde-free formula. Provides maximum strength with hydrolyzed protein and calcium for harder, longer, stronger natural nails with a hint of pink. Primes natural nail surface to increase adhesion of nail lacquer. Use prior to nail lacquer application on fingers or toes.